So this brings us to video games as a means of encouraging reading. There is no logical connection between these two activities—in my experience, the only activity that video game playing encourages is more video game playing. This is not inherently evil (just mostly), but neither is it going to achieve the stated end. But! also! “some educational experts suggest that video games still stimulate reading in blogs and strategy guides for players.” And nothings instills lifelong literary habits like video game strategy guides. ... Again, I have to wonder—how excited should we about every line of text a child reads? Is it an achievement that a child can establish basic communication with his peers, which is essentially what a message board allows, and which is completely different from understanding literature? Are food labels the next big literary thing? So I read this, and instinctively, I think this woman is kidding. After all, she wears glasses. Also, she identifies as a Chicagoan who now lives in a new city. Her punctuation is so Lewis Carroll. She is obviously very likable. She also belies, in her blogroll sidebar, an interest in casual gaming—how can I not assume that we are cut from the same cloth? Moreover, she notes elsewhere that, just this September, she was reading Children’s Literature: A Reader’s History. Why, this summer, I was reading a different history of children’s literature, Minders of Make-Believe (thanks, Seth)! So while I would ordinarily pay this blog entry no further thought, I am, instead, helplessly furious. I underscore MSI’s interest in children’s lit because, in her rant, she hints at having a broader suspicion of edutainment on the whole: she isn’t just skeptical of software targeted at youth, but also at mainstream children’s books and, I can only assume, various other media. And this is so frustrating, because we share a real interest—how best to cultivate children’s literacy and enthusiasm for learning—but, clearly, we approach this from completely opposing vantages. It’s a computer game in which you seldom read, only write. 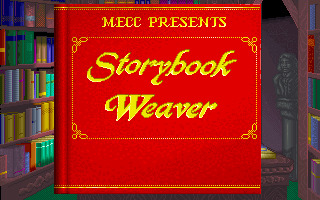 Maybe this is a strange place to begin a list about literacy, but alas, Storybook Weaver is the first game I played on our very first family computer. To be fair, this ‘game’ was nothing more than blank pages to type into, along with an enormous catalogue of clip art. But the clip art was populated with archetypes from folk- and fairy- tales, ready to be graphically remixed, mashed up, and ultimately, written about. Storybook Weaver was like magnetic poetry for elementary school kids. This was perhaps, in my quest to write the Great American Novel, my most prodigious era. The game had small bells and whistles—you could lend your characters little midi sound effects, or set certain picturebook pages to mood music—but the real joy was in printing every story out. Writes David Sears, in the March 1993 issue of Compute! Magazine, “Storybook Weaver supports a gamut of printers. Output is understandably a bit hazy on standard, noncolor printouts; the best dithering remains only gray scale, after all. Thoughtfully provided markers make the difference though. And after completing a story, kids can print it and then bind it just as in the old days—with string and staples.” So charming. 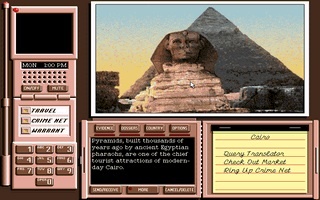 Although Carmen Sandiego made her first (dis)appearance in 1985, the Deluxe iteration was perhaps the series’ finest entry. Carmen Deluxe came bundled with that year’s World Almanac—an intimidating tome that, thanks to its density and accuracy, could make any 11-year old girl doubt the veracity of the Bible. And because my understanding of world geography, cultures, and religions was rudimentary at best, I used the 1992 World Almanac more than I’ve ever used any other concordance. For a child of the 90s, tracking a criminal across the globe was a feat of flipping pages and cross-referencing. It’s no hyperbole when I say that Carmen Deluxe was my very first research project. There was a slim volume packed in, too. The Acme Detective Guide—really only a glossy instruction manual—gave the dossiers of Carmen’s lightheartedly wicked cronies. I was rereading the manual this summer, and it is every bit as engaging as I’d remembered. And if you paid careful attention to all the clues you’d picked up during a game session (and if you referred to the criminal’s dossier as you chased him), you could infer the criminal’s identity well before you ever needed a warrant. 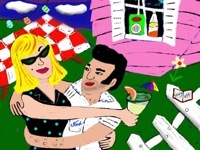 Carmen Deluxe wasn’t just a geography game. It didn’t only teach children how to use dense reference materials, either. It required the use of context clues and the process of elimination. Carmen Deluxe taught reading comprehension, and memory and recall. It was about the thrill of the chase, the joy of discovery, and the realization that even bookish, indoor kids like me could also be crime-fighting adventurers. I’m not sorry that I own KQ6 on CD-ROM—the voice acting and high-res character art are, especially for the time, feats of technology and artistry—but I am glad I played the near-soundless DOS version first. That sparseness of sound gave the mind’s ear a chance to wander, to create. Of course, KQ6, while certainly family-friendly, was by no means intended as an edutainment title. But completing the game meant doing a lot of reading and, to my 11-year old mind, the game competed with the very best fantasy novels I’d read. There was a pretty book tucked into the box, too—“The Guidebook to the Land of the Green Isles”—with clues and maps hidden inside. If I ever hoped to best the game, I would have to refer to it during my adventures. KQ6 wasn’t wholly linear, and there were branching subplots. As a relative latecomer to adventure games, I was astonished. This was the first point-and-click adventure I’d tackled on my own; not only was I really learning to recall bits of narrative and dialogue for the first time, I was also learning about a kind of visual lexicon and syntax. For the first time, I was scouring painted pictures for that puddle of pixels that I needed in order to finish a puzzle and nudge the plot forward. Narratives didn’t have to be strict, linear things, I realized. A narrative was made up of words, but also of actions, movements, and objects changing hands. Reading had become less alienating: it was creative play, a game of cat-and-mouse. And now, for the very strangest lesson I have ever learned from an adventure game: narratives don’t need to be ‘beaten.’ They don’t even need to end. Chop Suey looks a lot like a game, but it isn’t. Rather, and by the accompanying booklet’s own account, it is “a unique literary work original to CD-ROM. This exciting new multimedia platform allows kids to become familiar with the sounds and surprises of reading and storytelling.” Big talk, especially coming from software marketed to preteen girls! And yet the description sells itself short, somehow. Chop Suey is part storybook, part art installation, in which the only objective is to wander and to click everything. A click here, and Paprika tells your fortune. A click there, and the grunge kid’s girly mags fall out from under the bed. If you’re tired of being read to, you can turn the voiceover off (but why would you do that? It’s David Sedaris). Chop Suey is in turns twee, darkly funny, and melancholy. It is adventurous, but it is pensive. And even after repeated explorations, the town of Cortland, Ohio, somehow remains as inscrutable and enigmatic as ever. “Chop Suey is elliptical in a way that may frustrate some kids,” theorized Craig Stoltz, in gentle warning. “Some of the imagery and wistful sentiment will be lost on all but the user’s parents.” Perhaps. But for me, Chop Suey remains the late Theresa Duncan’s towering achievement: it is a love letter to childhood. My “Favorite Software and Edutainment Titles That Promote Literacy” list actually ends in 1995. Perhaps I finally became literate that year. But the abrupt conclusion of my list isn’t to say that modern video and computer games are doing a bad job at teaching kids. Plenty of games out there are educational, if inadvertently. As for those titles that inspire literacy and a love of the written word, many games—especially those of the role-playing and strategy ilk—are text-heavy and, yes, nicely written. So, too, are most games of “cultivation”, including simulations like Viva Pinata, the Harvest Moon series, and the Animal Crossing series. And it bears repeating that the Nintendo DS has invited a new generation of interactive fiction stories (Hotel Dusk, Professor Layton, the Phoenix Wright series) that reward reading comprehension, exploration, the retention of new information, and puzzle-solving skills. And we needn’t overlook the consistently good Nancy Drew adventure-mysteries (sneaky edutainment!) by Her Interactive. Why did I jump up to type this at all? I mean, if I put my blogging cap on each and every time I perceived a threat to gaming, or each time some piddling video game were blamed for society’s ills, I’d never take the cap off, right? Blame is one thing. It is quite another thing to deny video games their usefulness as learning tools. Because, when that happens, we threaten to deny children that learning tool. Children must know, early and often, that every activity—reading, gaming, watching TV, playing kickball—is an opportunity to learn, to read or write or create or imagine, to grow. We lose that knack as we age, don’t we? We stop learning one new thing each day. A lot of us stop blooming. But here is the power of a truly, truly great game, no matter your age: as you play, you do bloom, without your even noticing. These words don’t count! Only when they’re printed on paper do words help with literacy! It’s a fact! She should ask some librarians what they think about gaming and literacy. “Chop Suey” was the collaborative work of two women, Theresa Duncan and Monica Lynn Gesue (my wife), plus a host of others—illustrators, programmers, etc. It’s a little unfair to chalk it up as the sole achievement of the late Ms. Duncan. I actually had to look that up because I didn’t believe you. So I understand your ire. Still, I don’t think my remark is particularly unfair. I think it’s akin to calling KQ6 “Roberta Williams’ biggest achievement,” in spite of it being a collaboration with Jane Jensen and, yes, lots of other people. Oh HELLS yes! I think we had just about the exact same experience with Carmen Sandiego Deluxe Edition. Same thrill of the chase and hunting down what the flag of Belize looks like in the almanac (which IIRC, was in fact the same 1992 World Almanac. Blue cover, yes?). The fact that I thought that the videophone was possibly the coolest invention ever conceived didn’t hurt either. Were I putting this list together, I would be compelled to toss in the PC version of Mario’s Time Machine. The game had you, as Mario, literally surfing through time (on a surfboard no less) and jumping from one iconic epoch to another, interrogating NPC after NPC about Joan of Arc, Leonardo da Vinci, Johannes Gutenberg and other historical figures. Having read all this dialogue, you then had to re-contextualize all the information therein and regurgitate it into a fill-in-the-blanks style essay. Apparently essay-writing is pivotal in saving history from Bowser-created paradoxes. So reading + learning about history + Mario = fun! Oh, and if you fell off your surfboard going back in time, you wound up in the Cretaceous and had to fight dinosaurs. How cool is that? I’m a little surprised that librarian didn’t believe George K. Duncan worked with Gesue, who had the original idea, at Magnet. The collaboration that followed made the game a classic. Oh man, Carmen Sandiego ROCKED. That almanac was so awesome, even though nowadays it is completely obsolete thanks to google. I am of the mind that the best educational games are ones that are so fun, you don’t even notice the educational part. Like Oregon Trail; a game wherein you ended up learning about the people who wagon trained out west. I don’t think too many people think “oh, I learned this stuff from that game,” but would they have learned about it without it? Carmen Sandiego is another example. I personally remember playing the four Sesame Street games on Atari a TON as a little kid, and I think it helped me with those basic math and letter identification skills. That’s not to say there aren’t any other nifty educational games. As you said, anything text heavy is a place to start. Hell, my brother will not read a book for any reason, but RPGs? He loves them, and has since he was wee. Even blatant games like Math Munchers, or Mario is Missing, had their fun, though I argue they aren’t as effective. But when you get too overt, like, say, 3/4 of the game lineup on the Memorex VIS, I think you see a decided lack of results. Wow, I remember using storybook reader in the middle school computer lab in 5th grade. I also remember it being fun, but rushing through it so I could play Truckin USA and Oregon Trail. Everyone has probably forgotten about how angry they were with me for not duly attributing Gesue, so I feel somewhat safer in addressing the validity of my inadvertent omission. The game came out when I was 13; I would eventually play it 11 or 12 years later. While Chop Suey itself doesn’t have an entry on Wikipedia, elsewhere on the same site, only Duncan is credited with its creation. And though I stand by my blog’s stated sentiment—the game is a real testament to a talent we have lost—it does seem a shame that more complete information isn’t readily available.